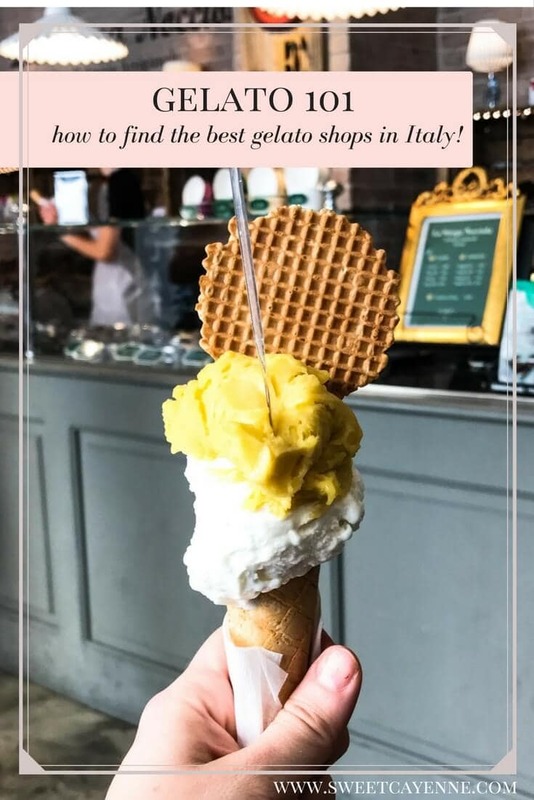 Today I’m giving you the run-down on gelato – from tips on how to find the best gelato shops in Italy to recommendations of my favorites! Ice cream and I have been having a love affair from quite some time – it likely started when my age was in the single digits. I practically eat the stuff every day and could probably live on it if I didn’t know any better. 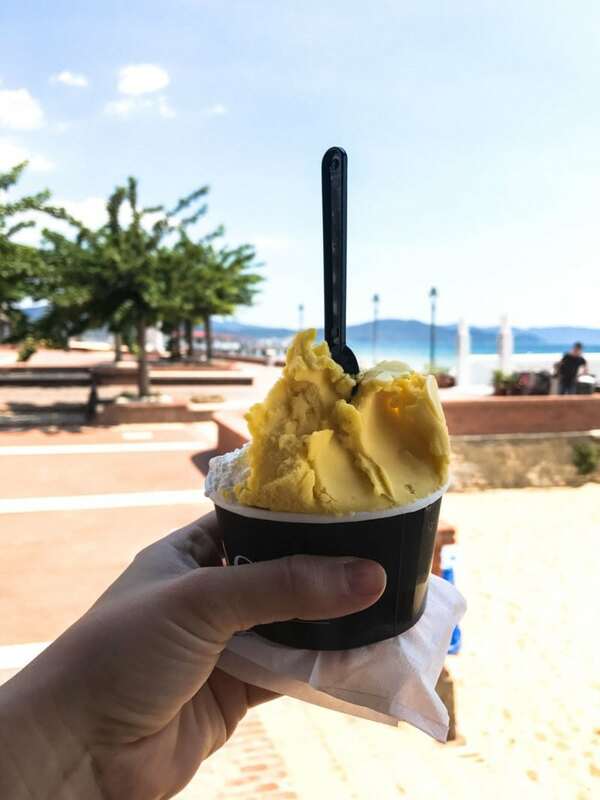 When I first visited Italy and was encouraged to have their version of ice cream (gelato) at least once per day, I thought I would die of happiness. Someone was giving me permission to eat “ice cream” every day??? How could life get any better? How is gelato different from ice cream? As it turns out, when it comes to gelato and daily consumption, things are looking pretty good. 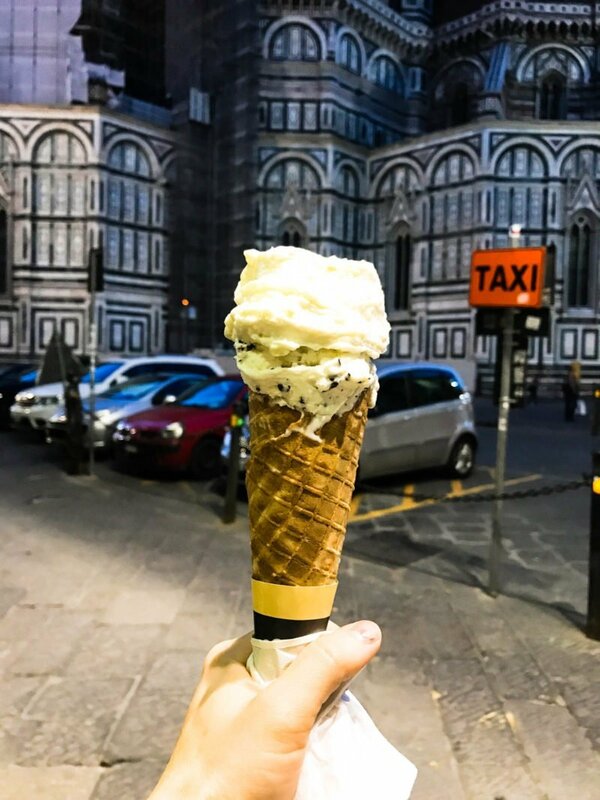 It’s lower in fat than ice cream (due to the use of more whole milk than cream, less sugar, and often fewer egg yolks), and with all the walking you do in Italy, consuming a piccolo/small sized cone (or two!) on the daily is not out of the question. And that is something we can all be pretty happy about! With less fat and less sugar, you’d think gelato would not be all that great in the flavor and creaminess department. But a very slow churn rate and slightly warmer serving temperature keep gelato dense, creamy and prevents iciness. The slightly warmer serving temperature and all-natural, high-quality ingredients rack up major points in the flavor department. 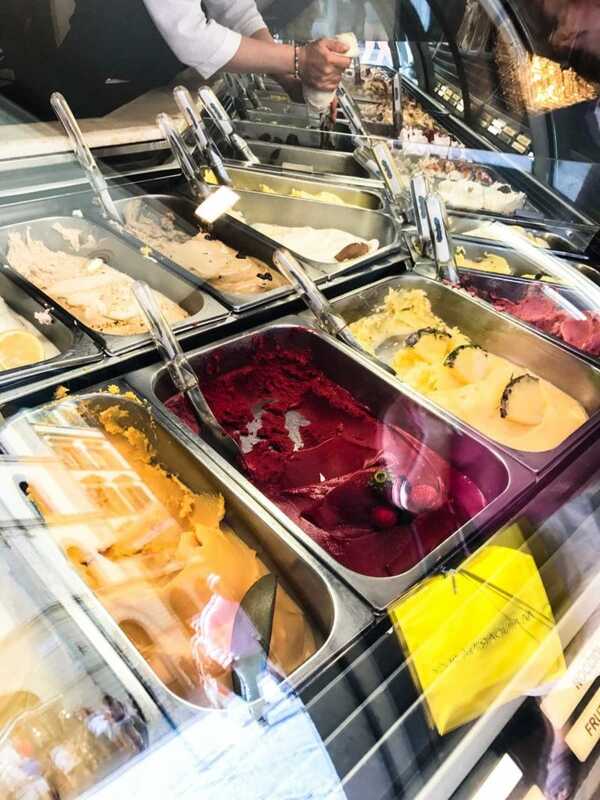 And if you are lucky enough to find a gelato shop that churns out fresh batches daily – this is the ultimate – you will be hard-pressed not to insist on a mandatory daily gelato fix! Avoid shops with piles of gelato swirled high and adorned with fancy food garnishes. I know, looks are tempting. HOWEVER, these types of gelato shops typically have their gelato made in bulk (meaning not daily) and often times don’t even make it in-house. Food coloring, additives, and preservatives often make their way into the picture, and sometimes the gelato can have an icy or overly airy/whipped texture. 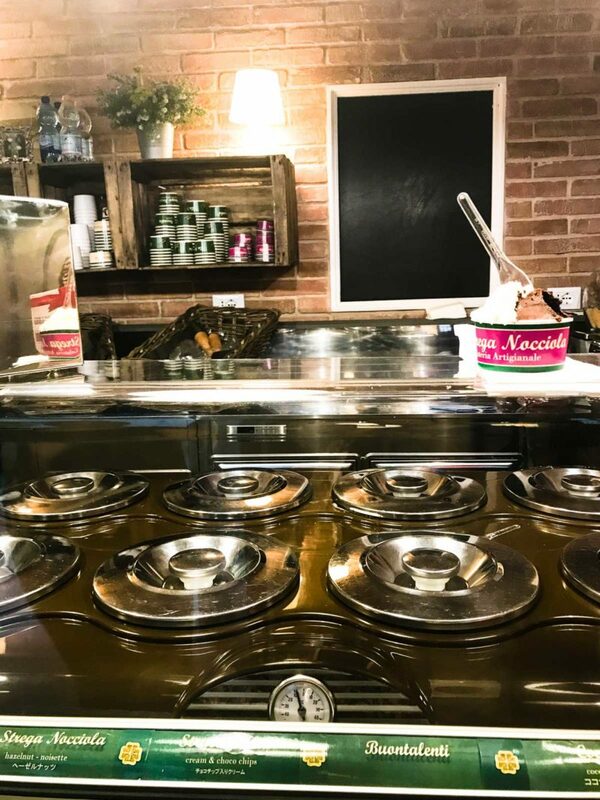 Look for shops where the gelato is stored in canisters underneath the counter. We eat with our eyes; and yes, we like to see what we’re purchasing before we buy it. But gelato that’s stored in small canisters underneath the store counter is MUCH fresher and has a better texture than the gelato that is swirled high into bins with lots of garnishes. If you find a shop that keeps the gelato stored out of sight, you know you’ve found a good one. And if you want to have a better idea of what you’re buying, ask for a taste of the flavor you’re interested in! Most servers are happy to oblige – especially if the line is short! Look for menus with flavors that rotate daily. 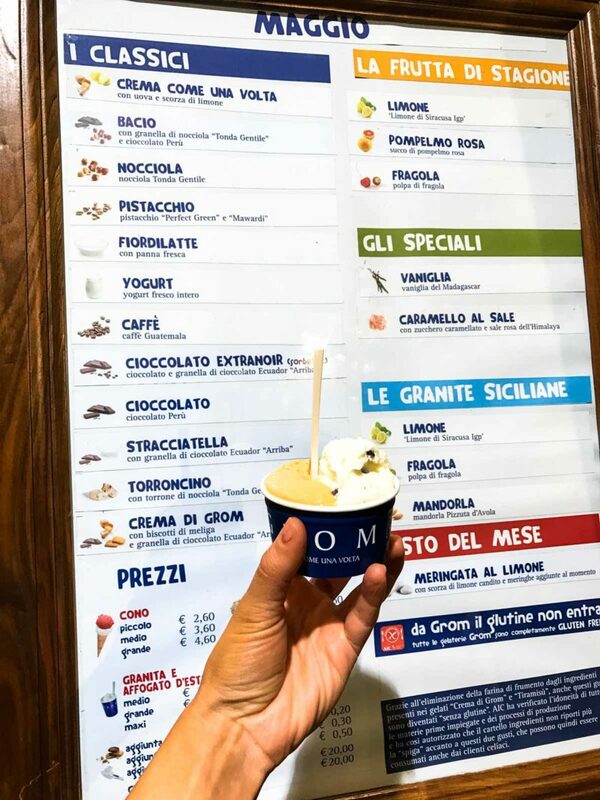 Menus with a small list of flavors (12 or less) and daily specials indicate that the gelato is made fresh each day with seasonal, fresh ingredients. This is a good sign! For example, when I visited in May, fragola/strawberry was often on the menu because strawberries were at the peak of their season. Avoidance of artificial colors and flavorings. Italian food producers are often committed to producing the highest quality product they possibly can, and pride themselves on artistry and authenticity in the products they sell. A gelato shop that is committed to the farm-to-table concept, use of seasonal ingredients, and avoidance of additives will often advertise this proudly in the form of signs that give you an in-depth explanation of their product and how it is made, like in the sign above. Use of locally sourced and seasonal ingredients. As I mentioned above, artisan gelato makers are committed to using the highest quality ingredients they can find. In fact, I just learned that my favorite Florentine gelato shop from a visit two years ago has relocated 45 miles north of Florence so they can work more directly with organic egg and dairy farms. That is commitment! And you really can tell a difference in the overall quality, flavor, and texture of the final product. 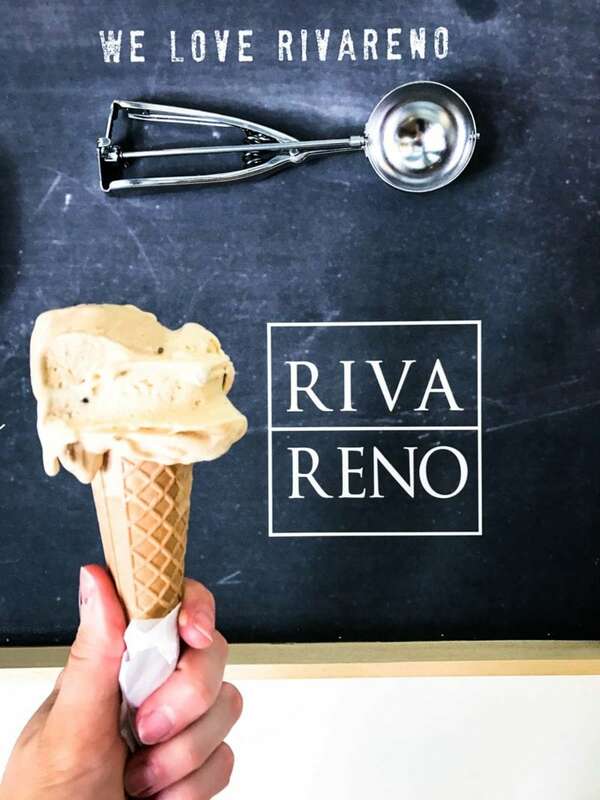 Rivareno – I stumbled upon this shop while looking for my favorite one from a previous visit. I was pleased to see the actual owner/gelato maker serving behind the counter that day – he was so kind and friendly! This shop also sells freshly made crepes – try one filled with Nutella and topped with a scoop of coffee/cafe, panna cotta/sweet cream, or salted caramel gelato! Grom – this shop is a gem of delight hidden on a little street to the side of the Duomo. Grom has daily specials and also serves affogatos (gelato drowned in a shot of espresso). Their salted caramel is the best I have tried – you can taste the butter in it! Gelateria Eduordo – this gelateria prides itself on being 100% organic. Their flavor list is small and rotates daily. My favorite thing about this gelateria, however, is that they make their cones in fresh small batches throughout the day in a waffle iron. The fresh cones are the first thing you smell when you walk in and are too delicious to resist! 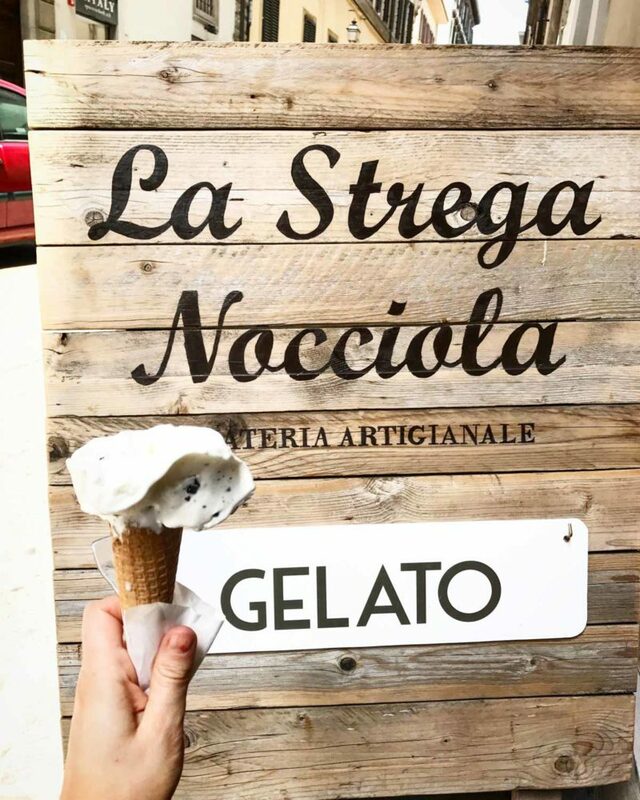 La Strega Nocciola – this is my number one FAVORITE gelato shop in Florence. Their flavors rotate daily and are so intense that they linger on your taste buds after you’ve had a lick. Their cones are made fresh daily as well. The coco/coconut, stracciatella/chocolate chip, and chili-chocolate cannot be missed! My favorite part about the stracciatella/chocolate chip is that the chocolate shavings just melt in your mouth. And I love the shop’s farmhouse style decor! What are your recommendations for the best gelato shops in Italy? I’d love to know – leave a comment below!